ROOH – Just a half a mile walk from ONE Mission Bay, ROOH is the perfect spot to stop by on your way home. 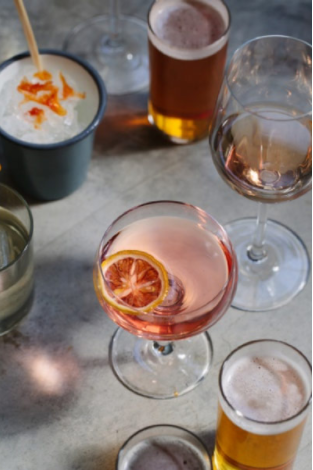 This Indian-inspired restaurant and cocktail bar’s happy hour includes $8 wines by the glass, $5 beers, and delicious small plates such as their Assorted Papad, Malabar Prawn Sausage, and Chili Pakoda with ricotta and mint chutney. Don’t forget to ask about their cocktail of the week! Deals are offered Monday through Friday from 4-6pm, bar only. The Bird – Touted as “San Francisco’s ultimate fried chicken sandwich shop,” this fast-casual dining spot is only a 10-minute drive from ONE Mission Bay, and serves a killer fried chicken sandwich, in addition to other offerings that are equally as enjoyable. The Bird’s happy hour is quick and simple: $3 tallboys and $2 hot wings from 4-7pm, Monday through Friday. Don’t forget to grab a handful of napkins – it’s about to get messy! The Perennial – Not only is The Perennial one of America’s most sustainable restaurants, but it also has a happy hour special that should be taken seriously just the same. From 3-6pm, Monday through Saturday, deals include half off a featured cocktail, wine, and beer of the day, in addition to 25 percent off all draft cocktails, wines, and beers. City Counter – This new-school deco luncheonette is more than just a charming, minimalistic restaurant with salads and sandwiches. Serving deals Monday through Friday from 5-7pm, with accurately named please come in after work prices, City Counter offers specially priced bites including salt cod deviled eggs and chips with artichoke or pimento cheese dip. Pair those with $5-7 beers and $10 wines by the glass and youve officially done happy hour right.